Lindsay is a third year Physiological Sciences major. 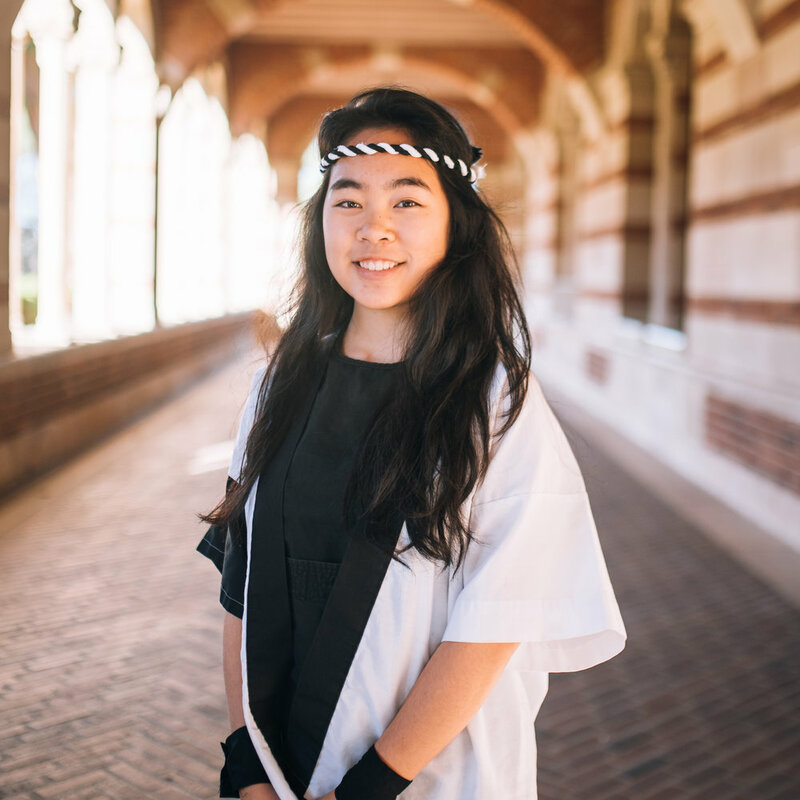 She loves how Kyodo has not only given her a greater appreciation for the culture in which she comes from, but has surrounded her with a second family at UCLA. Kyle is a third year Physiological Sciences major. He enjoys Kyodo because of all the friends and memories that he's made. Sophia is a fourth year Music History major. Her favorite thing about taiko is that it creates a lot of sound, visuals, and a special kind of atmosphere for creativity. She loves experimenting and getting to use her imagination to figure out how to perform while sharing that experience with fellow Kyodies and the audience! Minami is a fourth year Psychobiology major. What she likes most about taiko is that it connects her to so many great friends that she would have never met otherwise, and that it makes her feel strong even though she's small! Kellie is a fourth year Psychobiology major. 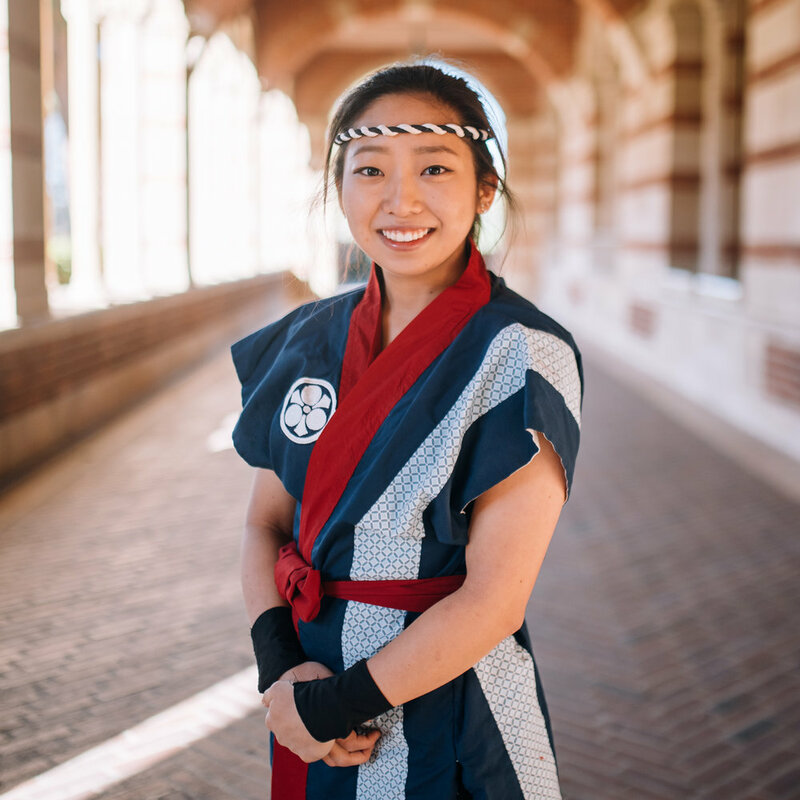 Playing taiko at UCLA has definitely enhanced her college experience and allowed her to embrace her Japanese culture. Being a part of Kyodo has brought her lifelong friends and so many memories that will last a lifetime. Ryan is a fourth year Civil Engineering major. Taiko has been an important part of his life for 11 years now. He didn't think he'd have the chance to continue his taiko career, but he loves Kyodo for providing him with the opportunity to continue. Gianna is a third year Civil Engineering major. Amidst all the schoolwork, taiko provides her an outlet and a group of people to lean on and goof off with. She found these people in Kyodo, a home away from home. Tiffany is a third year Molecular Cell and Developmental Biology major. She enjoys being in Kyodo because she finds herself in a group of people that continuously encourage one another. With her time playing taiko, she was able to develop herself, both musically and personally, alongside a supportive group of individuals. Ray is a third year Dance and Psychology double major. The art of performing is something they've explored all their life, but to be able to perform with such a passionate and close community of people is truly something special. Kyodo has become their inspiration, support, and family. Yi-Ling is a third year Biochemistry major. Her favorite thing about being on Kyodo is being able to play cool things with cool people. Bradley is a third year Electrical Engineering major. Kyodo has given him the opportunity to stand on the performance end of taiko, something he has only been a spectator to before college. The adrenaline of performing, the pride of perfecting a piece, and the joy of being part of this family are reasons why Kyodo is such an influential piece of his collegiate journey thus far. Elise is a third year Pre-International Development Studies and English double major. Aside from the incredible group of humans that she has met in Kyodo, she enjoys the connection that the team has given her to the Japanese-American community. Performing at Manzanar, playing (and dancing!) at her first obon, participating in NSU CN, and seeing the relations that the taiko world has to the current JA culture has given her a wonderful perspective that she wouldn't have otherwise gained in her college experience. Isaac is a second year Percussion, Musical Education major. He joined the team to work hard, have fun, and make music with a new taiko family. Micah is a second year Biology major. As a freshman striving to push out of her comfort zone and explore new things, Micah wanted to find a strong, tight-knit community she could be a part of. By joining Kyodo, she feels that she can develop self-confidence, foster creativity, compose her own music, and form friendships that will last for a lifetime. Brandon is a second year Biology major. Throughout the next four years, Brandon hopes to create lasting friendships with other Kyodo members. 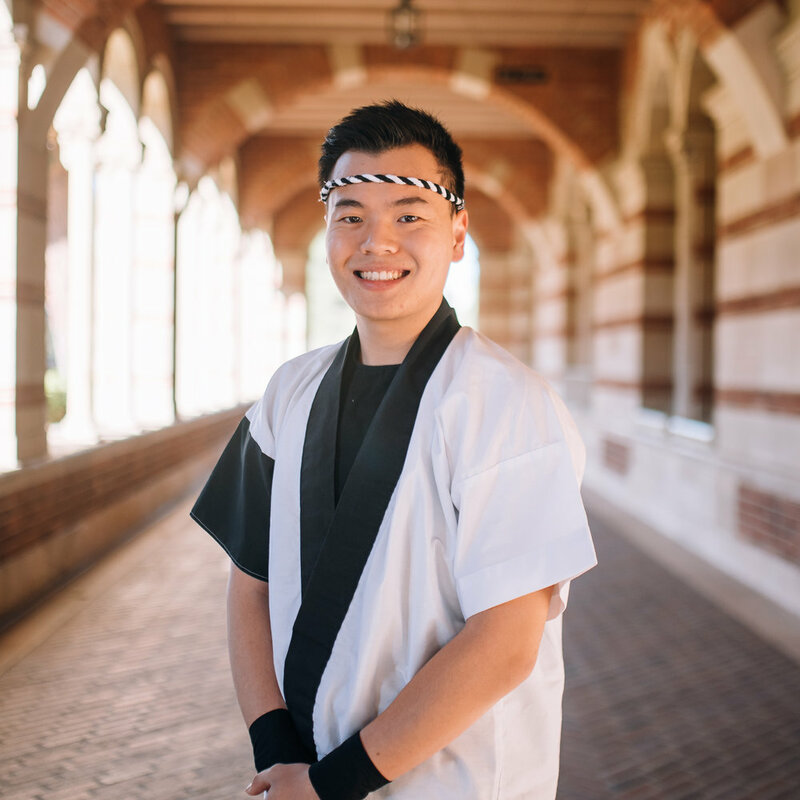 He also hopes that he can forge a closer connection with his Japanese-American heritage through taiko and the taiko community. Jenny is a second year Computer Science major. She's looking forward to performing with this large group of friendly people. Jenny initially began just wanting to play some drums, but now she also wants to enjoy herself in a fun and creative environment outside of academics and hopefully get the opportunity to help the future Kyodo members someday. Jason is a second year Neuroscience major. He came into Kyodo seeking friendships and fun, but he realized that he's actually found a family. 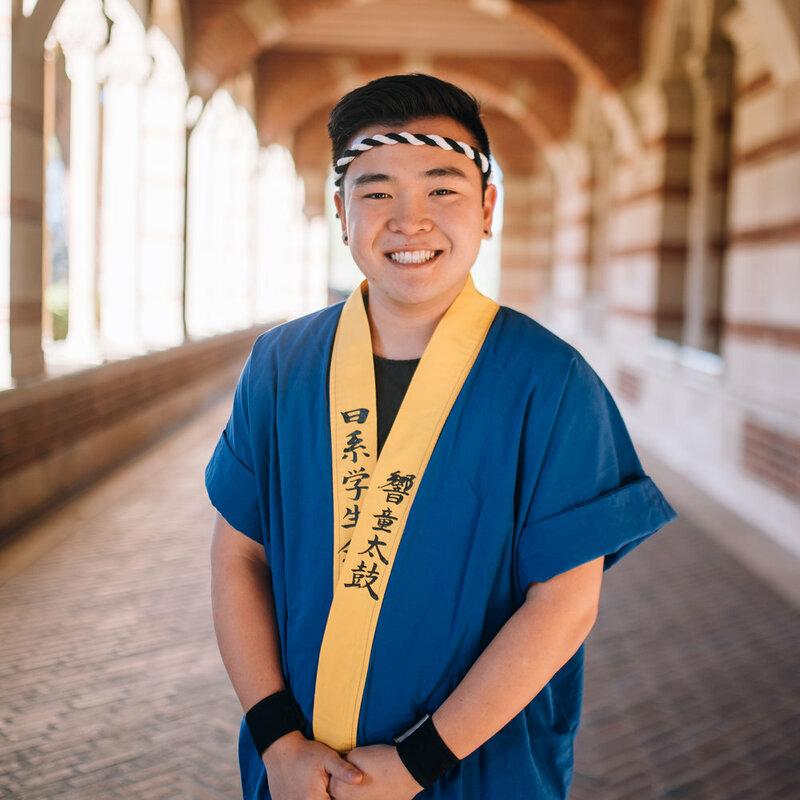 Jason has also come to deeply admire taiko and want to learn every aspect of it, in hopes of spreading an artform that has given him so much in his life. With Kyodo Taiko, Jason hopes to grow as a person as well as have fun playing drums with fantabulous people! Emily is a second year Psychobiology major. She's looking forward to making memories and performing with a warm family of musicians. With the support of this tight-knit community, Emily hopes Kyodo gives her the opportunity to challenge herself and become a better player and person. Kiana is a third year Neuroscience major. Becoming a part of the Kyodo family and being able to embrace her Japanese culture has been so much fun. She can't wait to learn, grow, and perform with such an incredibly talented group of people. Niveda is a third year Physiological Sciences major. After going to workshops, she met genuine and kind people who were in her class and were previously on the team. She then realized that she really wanted to be part of Kyodo. Niveda is looking forward to playing music and learning a new skill through Kyodo!